As you can see, my tiles were black. They were painted when purchased, and had lots of marks on the sides. That’s ok, because we are going to cover the top and sides. Apply the Mod Podge to the top of your tile, and then place on top of your scrapbook paper. Trim the sides as needed, and make sure to cut out the angles like the picture above so your sides fit together easily. Add Mod Podge to the sides of the coaster and place the side flaps up to cover the sides. Let dry for about 2 hours. Flip the coaster over to the picture side, and apply an additional, thicker coat of Mod Podge. Let this sit for a few hours to dry. Once dry, spray paint with the clear coat for extra protection and again let dry. Super cute! Perfect for a house warming or party gift, or to keep for your own. Either way, everyone will love these one of a kind coasters. There are so many unlimited options and ideas you can do with this tutorial, I can’t wait to see what everyone else will make. As always, feel free to PIN it if you like it, and you can also follow me on Facebook here and Twitter here! Thanks for stopping in. This is a quick and easy recipe that is sure to make all of the pizza lovers in the family happy. It only calls for a few ingredients, and about 17 minutes! Let’s get started. How simple and easy was that? VERY! You can also add additional ingredients such as a light coat of marinara and some bell pepper or onion to give it a little additional flavor. For this kids, this is perfect as is. Grab some chocolate eggs and add them to your nest. All finished and ready to eat! Simplicity at its finest! Had fun making these this weekend! First thing to do on the list was gather my supplies. You can get these at any of your local craft supply stores. Start out by putting a thin layer of Mod Podge onto your canvas. Make sure to get your entire surface before placing your fabric down. Take your scraper and smooth out any bubbles you may see once you put your fabric down. Push these into the corners to get them all out of your fabric and canvas. You want to cut the corners out of the fabric as shown to fit your fabric up nice and snug. Use your Mod Podge on this as well. Once you have glued up the back overlapping pieces, your canvas should look something like this. ***Flip over once dry and make sure to SEAL your project by adding an additional layer of Mod Podge OVER the fabric. Then let your project dry overnight. It is now time to start designing the letter you chose and heat up your glue gun. I did not count, but I almost completely used one bag of buttons, with about 20 leftover (each bag has 120 buttons). As you can see from this picture I have overlapped a few here and there to give it a little more dimension. I had a ton of ribbon from when I made my oldest daughter hair bows, so I grabbed a couple or ribbons that I liked the best and made a cute little bow. The plain pink ribbon is about 12 inches in length for the back. I took my ribbon and used the hot glue gun to attach it. This wall art is actually very light, so I am not worried about this pulling apart. Final step – Attach your bow to the ribbon. I did this step by finding the middle when hanging, and attaching with a dab of hot glue. I also tied a piece of pink thread over the bow and ribbon, securing them nicely. Here is our final product! This was a fun project, and I can’t wait to hear what my friend says about baby K and her new Button Wall Art. Did you like this tutorial? If so, let me know! I love to hear back from you, and will always respond to comments. Follow me on FaceBook by clicking here, or on Twitter here. You can find all of the supplies used in this tutorial at your local craft store. 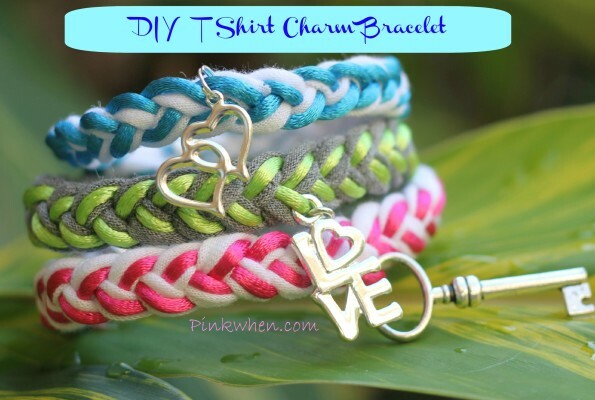 DIY T Shirt Charm Bracelet Tutorial…one of my favorites! You can never have too many bracelets, and my daughter LOVES to stack these up. Let’s get going! You can easily grab all of your supplies from the local craft store, and I have also added a couple of affiliate links below in case you want to order online. 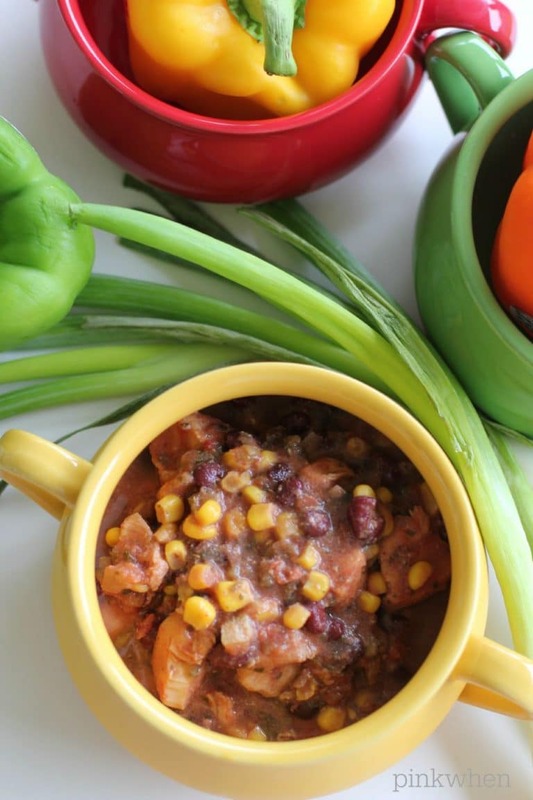 One of my all time favorite recipes is the slow cooker chicken tortilla soup recipe. It is super quick and easy to make, and my entire family seriously loves it. I love to crush tortilla chips into the bottom of a bowl, top that with cheese, and then scoop this yummy recipe over the top. It is seriously delicious, and one of our favorite recipes. I love how great it tastes after cooking all day long, and you will love the flavors this recipe creates. Plus, if you like freezer meals, I am sharing how to make this, freeze it, and save it for later. Let’s get started! Today we are going to do a super fast, super simple scarf tutorial. There is a little sewing involved, but nothing a novice (like me) can’t handle! First we are going to start with some white jersey knit material I had left over from a previous project, and some leftover button fringe. I loved the colors on these buttons, and they are perfect for Spring! Pair up your new scarf with some jeans and a light sweater, perfect for Spring! Add some color, with all of those Spring buttons this simple lightweight scarf can go with almost anything. Did you like this tutorial? If so, leave me a comment! You can also follow and leave comments on Facebook or Twitter. I love to hear back and will respond to any questions or comments. Have you ever wanted to paint a glass vase just to create a change? I have a sweet hubby who showers me with flowers, so of course I have a TON of clear glass vases. I have been wanting to make a few projects, and coloring these plain clear vases was on my list. The first step is gathering your supplies. You can find these at your local craft store. For this quick and easy project you will need your glass vase to paint, your preferred glass paint, and a paint brush. For my paint, I used Martha Stewart for glass, wood, etc. It covers and dries really well. Make sure you smooth your paint all around. For this particular vase the brush would not get under the “lip”, so we used our hands to smooth it all around the top. All done! These are the new painted vases after the first coat. Let your paint dry and apply a second coat if necessary. I can’t wait to add some craft store flower arrangements to these! Did you like this post? Let me know! I love to hear from my readers. Leave me a comment here, or follow me on Facebook or Twitter and comment there! I don’t know about the rest of you, but sometimes FaceBook is just NOT GOOD for my pocket book. Between all of the cute children’s wear, to jewelry auctions, you can just “click” and “comment” and you are $$$$ lighter in your pocketbook! This is one of those items that would make my pocket book lose weight! Now, I LOVE this necklace, and I ADORE Turquoise, and even though this has yet to go up for auction at Dallas Rocks Jewelry Auctions, I knew at once I had to make this for myself. So…I RAN to Michael’s with my 40% off coupon and purchased these flat stone turquoise rocks for less than $6 with coupon. I also purchased these gold metal beads, and some natural cotton braiding cord. The total purchase was less than $10. You are going to need about 30″ of the cord, and as you can see in the pic, I also took my scissors and kind of angled the tip of the cord. The holes for the turquoise are small, and using an angle helps. *You will also probably snip an inch or two here and there as the end frays, but you will have enough cord! Promise. 1st. Line up the stones as you would like for them to be placed. I used 5 stones, and had them in the sizing order of my preference. 2nd. Tie a know in your cord. Add two metal beads, and then tie another knot. 3rd. Add your stone, then tie a knot again. You will continue alternating these steps until you are finished adding your stones, then follow up with another knot, two more metal beads, and your last know. There you have it, all done and ready to go! Super cute, handmade, and less than $10! Did you like this tutorial? Let me know by leaving me a comment! I have been on this fabric flower thing lately. I just can’t stop! Here is a super quick tutorial on how to make little fabric flower barrettes from your left over fabric! Step one: Grab all of those leftover fabric pieces you have been saving from your t shirt scarves! Begin by rolling your fabric up about 5 times for your center. Then glue, and start wrapping in a circle. Make sure you add a twist in your fabric, and then glue, about every one to one and a half rotation. When you have finished rolling up all of the material, glue the back really well to keep it nice and tight, and then add another piece of fabric to hold it all together. I cut my back fabric a little longer so that my flowers would have some extra foliage. Cut any stray frays you may have, and then glue your chosen clip in place! 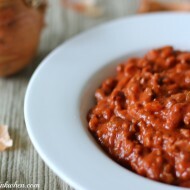 Here is another heart healthy and yummy recipe for you to try. This recipe is one of my NEW favorites. While I have had Tuna Steaks before, I have never had them with this new recipe, so check it out and let me know what you think! Heat up your grill to 450 degrees. Add your Tuna Steaks to a large freezer zip lock bag, and then continue to add all of your ingredients. Mix around in the bag really well so your steaks are well covered. Place in the refrigerator for 30 minutes to an hour to allow all of the flavors to soak in. These are so super juicy and are really good for you. Pair this up with some veggies and a nice salad with an Italian dressing. Something about dipping pieces of this Tuna Steak in the leftover dressing is scrumptious! Here is a cute another fun little felt flower bracelet tutorial for the little one in the house. These cute little wristlets are making her sooooo happy! Here are a few little supplies you will need to make these. Felt of your color choice, scissors, glue gun, and a Keurig coffee cup 🙂 These little coffee cups just happen to be the perfect size for this tutorial. Draw your circles out on your felt. You are going to need six of these. Now we have our 6 pieces and are ready for the next step. You will fold once, and then fold again to get a triangle piece as seen in the picture to your left. Do this with 5 pieces, while leaving the 6th piece as your base. Place 4 triangle pieces on the circle felt and glue them down, and then in the middle add your 5th piece. Glue your elastic in a circle, and then glue to the back of the flower. I also took another little felt piece that was left over and placed it over the wristlet for some extra security. And there you have it! Happy baby and her sweet little bracelets! She is so proud of these. Today I am going to show you a fun little felt fabric flower bracelet (say that 5 times in a row real fast!) tutorial. Super cute, easy, and fun. There are so many different options you can use fabric flowers for, such as bracelets, necklaces, rings, hair accessories, etc. You will need felt colors of your choice, a glue gun, scissors, and ribbon or 1/8″ elastic to make a little wristlet. I chose the ribbon for this tutorial. You can find these supplies at your local supply store, or you can get them right here. The first thing you want to do is cut a nice round scalloped circle. After you have cut your scalloped circle, cut in a spiral going round and round until you reach the middle. Take your circle, and starting from the outside, start gluing at the bottom edges. Keep gluing and rolling your flower all the way to the end. Once you reach the end, glue the last portion of your scalloped circle to the bottom of the flower to keep it all in place. Once you have finished your flowers, attach them to a ribbon and you are ready to wear. There you have it! Super cute, easy, and fun. Perfect for a little Valentines Gift for your daughter, or yourself! One of the easiest and yummy pork chop recipes I have found. As a busy mom, we don’t always have the time to make the healthiest meal, and time is always running away from me. 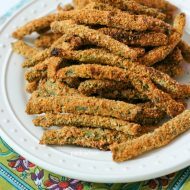 I have found one of our favorite recipes to share today. It’s quick, easy, and yummy! Heat your oven up to 350. Mix in a small bowl the soy sauce, worcestershire sauce, ketchup, vegetable oil, and lemon juice together. Rinse your pork chops, and place them in a glass baking dish. Place half of your mixture over the top of the pork chops and bake for 30 minutes. Remove from oven, turn over pork chops, and cover with the remaining mixture. Bake for an additional 30 minutes. You are all done! 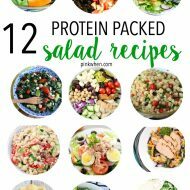 Add a salad, mashed potatoes, and some bread! Today we are going to show you how to do another no sew T Shirt project. This one is super fun because you can do a lot of different things with it. Let it hang long, tie it as in the picture, scoop to the side and add a different color fabric flower, or several, and more! Let your imagination run with this scarf. First thing we are going to start with is a T Shirt that is a XXL or larger. This gives us plenty of room for the circles we need to draw on it. You can get these from Hobby Lobby for less than $6, or even better, Goodwill, or your own closet! Next, take your scissors and cut straight across from directly under the arms. You also want to cut the bottom seam portion off as well. Save that bottom piece, you will need a portion of that later. Next, cut up the sides of the shirt so that you now have two separate pieces. Grab your paper plate, pen, and scissors. Place your paper plate on the shirt and draw as many circles as you can fit on each piece of material. I was able to get 3 circles on each one, and you should average 3-4 depending on how large your shirt is. Cut out all of your circles, you should have a little stack of 6-8 pieces. Now cut about two inches out from the edges, and go all the way around the circle. It will get smaller and smaller until you can’t cut anymore. Your piece should now look like this strip here. Now grab both ends and stretch as long as you can. You will see these pieces get about twice as long as they were before you started stretching them. Then just hold one end up, and run your other end down the entire length a few times to create more little ruffles in it. Do this to all of your pieces. Now take that bottom seam portion you had earlier from scrap, and cut a small piece out. Find the middle of your lengths, and tie that small scrap piece together to hold all of your strands together for your scarf. Save that leftover seam scrap, because these are great pieces to use to make your fabric flowers with! Cute accessories for headbands, shirts, scarves, etc. And there you have it! Easy as pie! This tutorial does take a little longer than yesterdays no sew tutorial, but it is just as fun! Add a fabric flower, or tie to the side, there are many different ways to wear these scarves. This week we are having a scarf week! 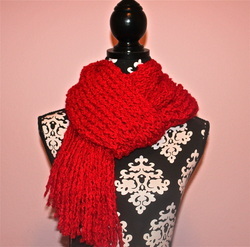 I plan on doing several different scarves over the week with instruction. I created this first scarf from a loom, and it really didn’t take me as long as I anticipated! When I was younger, my mom and I would sit and crochet, and I have picked it up and put it down several times over the years. I have never created anything with a loom. So here goes! There is also a video at the bottom of this post to help explain things better. First you will want to start of with all of your supplies. You loom, your chosen yarn, and the hook for the loom. You will also need a crochet hook to remove the scarf from the loom. (I also have the hair band on so I know where I want to stop on the loom. That marks the width of my scarf.) You can get these at your local craft store. To get started, you will tie a slip not to the end of the loom. This stays on the end peg for the first several rows until your scarf starts descending thru the loom, and then you can remove from the peg and let it also go thru the loom. You want to make a row with your yarn alternating from the front and back pegs in a figure 8 loop design. Finish to the end of the row, and then turn and do a second loop on the pegs. Once you have that second row, you will take your hook and pull the bottom loop OVER the top loop. Once you have done this on all of the loop and on both sides, you will then push the loops on the pegs all the way down, and then once again start your figure 8s until you have created a second row again, and then repeat flipping the bottom loop over the top loop. Continue this over and over to get the desired length of your scarf. One you have finished, you will then bind off with the crochet hook. (I forgot to take a picture of this, but there are a ton of great videos on you tube) Basically it is just stitching thru each loop off of the loom, and then removing that loom. After you have removed the loom and locked in the stitches, add some fringe, and you are ready to go! Easy as pie, and this was also my first scarf from a loom. Tomorrow I am going to try some quick infinity scarves! Did you know there are good fats and bad fats? Knowing which of these is good or bad for you can make a BIG difference in your overall health. Eating healthy also doesn’t mean sacrificing flavor or the fun of cooking up something yummy and healthy! Preheat the oven to 425. Cut a piece of foil large enough to place the salmon on, and be able to also cover. Place the salmon on the foil, and sprinkle the salmon with salt, pepper, and rosemary. Then place the lemon slices, garlic slices, and onion slices over the salmon as well. Brush the olive oil on over the salmon last, and then cover fully with foil. Place the salmon in the oven for 15 minutes, or cooked through and serve immediately. Perfect with a side of veggies! If you are not fond of Salmon, other oily fish like Tuna, Mackerel, and Herring are also able to give your heart the same healthy boost!